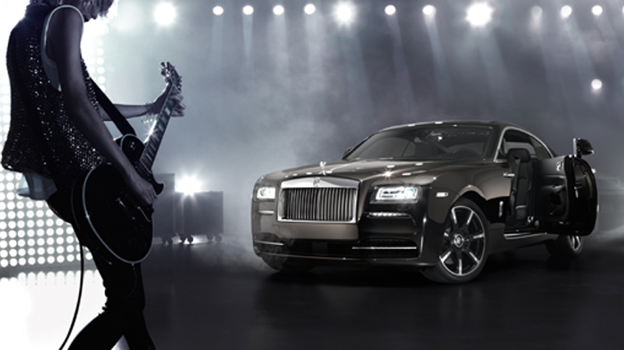 Rolls Royce is aiming to capture a new generation of music lovers after unveiling an 'Inspired by Music' edition of its popular Wraith car. The new model, which comes with a sleek new website too boot, promises a punchy 1,300W, 18-channel bespoke speaker setup that is minutely designed to make sure that it brings the best sound quality possible. That's not all. One of the niftiest features is a microphone that monitors noise outside the car to adjust the volume and tone inside to the best level possible so that passengers get the 'Inspired by Music' experience promised by Rolls Royce. All over the car there is a lyrical copper finish that takes this Wraith over and above others in the range and the surface finish on the exterior is designed in such a way that it shimmers like an 80s rock star jumpsuit when light passes over it. Pricing isn't alluded to by Rolls Royce but if you live the rock star lifestyle then forking out for this blinged up metal machine shouldn't be any bother.